SMEs Change the World!! | Think the Unthinkable Future. The day before yesterday, I arrived at the Dulles Int’l Airport in D. C. Almost one and a half year has passed, since I paid a short visit to here during my world tour in 2013. 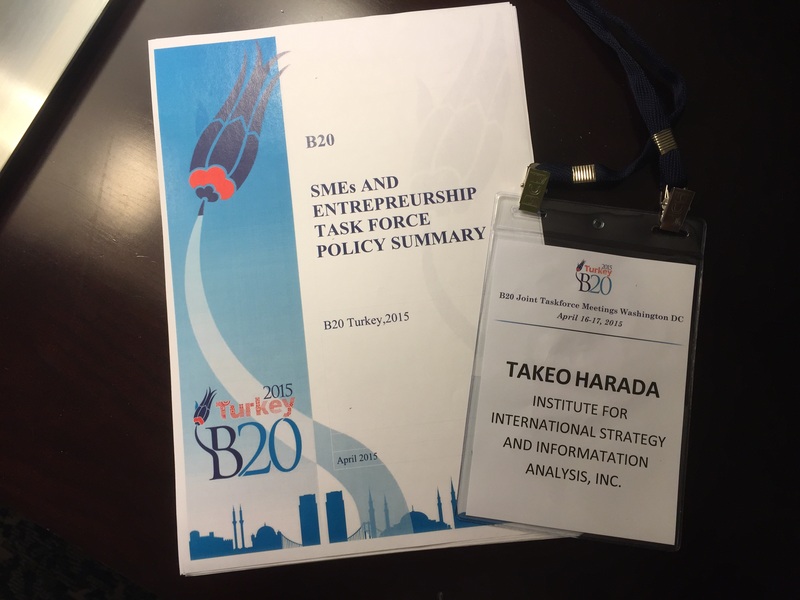 This time, I’m entitled as an official member of B20 to actively participate in its meetings. Yesterday, a very intensive discussion of our task force dedicated to SMEs and entrepreneurship was held in the Ronald Reagan Building. Although almost 80 percent of GDP in every industrialized country is produced by SMEs, the mainstream of political decision makers haven’t paid enough attention to them especially in international arenas. Regarding this lack of attention rather as a good opportunity, Turkey, the chair of this year’s G20, launched our task force, where we focus on what recommendations we should formulate on behalf of G20. This was the third meeting since the kick-off in March in Istanbul, where smart guys from Accenture as the knowledge partner of G20 chaired by Turkey presented their “long list” of potential recommendations to us. After having discussed three hours (! ), our recommendations are summarized tentatively in eight parts. They are to be further condensed maybe in three or four sentences, while all the task force members are asked to get together online for telephone conference to be held on May 13. 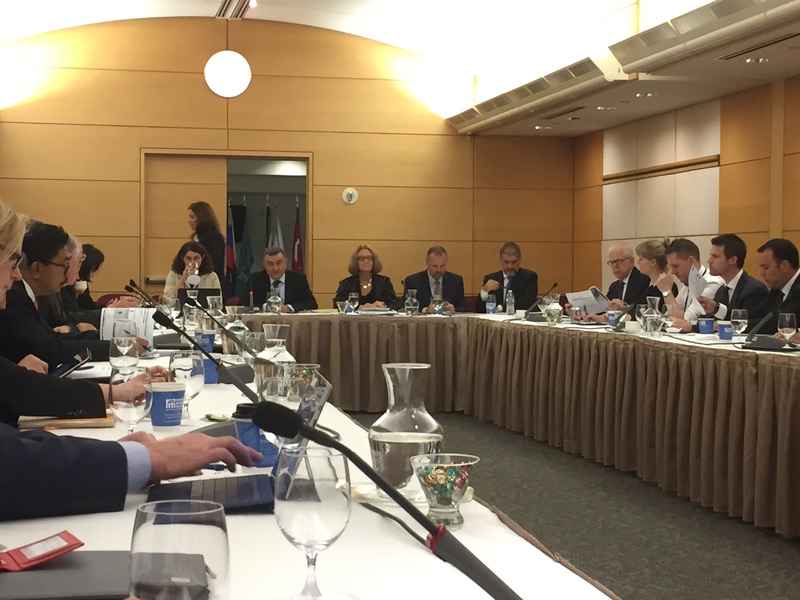 On June 6, the joint task force meetings will be held in Paris, at the fringe of the OECD meetings. In July, our recommendations will be finalized together with recommendations proposed by other task forces and passed to G20 fora in autumn. Although some task force members expressed their dissatisfaction in terms of house keeping matters, I myself find the whole discussion process fair and satisfying. For example, for those who are not verbally capable to express their comments and ideas in a perfect matter, written comments and ideas are always accepted after the meetings. Each additional comments are reflected in documents of the following meetings with explanations on how the secretariat treat them. Just before the last teleconfenrence in the latter half of March, I had sent a written proposal of recommendation to the secretariat, which was then reflected in a PPT sheet during yesterday’s meeting (See the first “additional recommendation” in PPT sheet shown below). At least, the secretariat doesn’t ignore voice of all the task force members and tried to somehow pour it into the discussion stream. 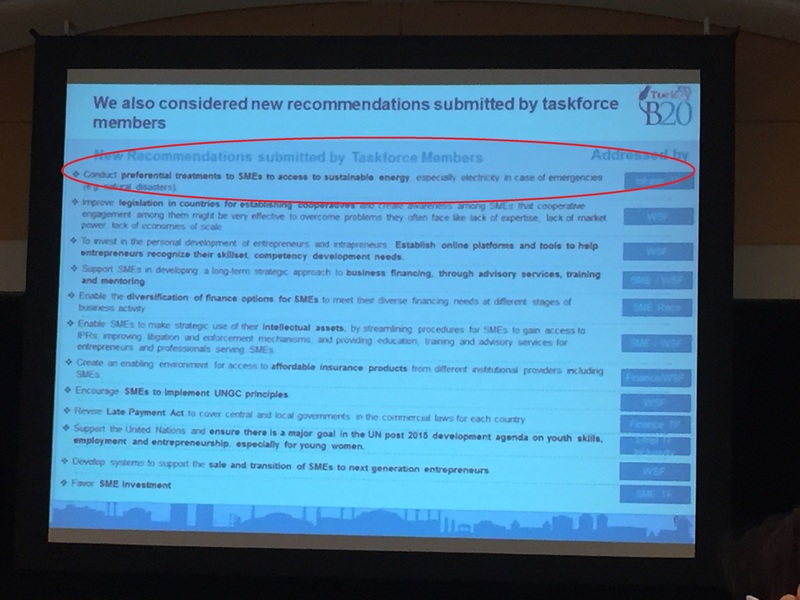 Obviously, Japan is underrepresented in this B20 process, even though it is the very entity which prepares the first draft of policy recommendations in terms of world economy for G20 process. The secretariat now calls on all the B20 members to advocate their work to their mother country’s government and list potential impediments against the recommendations. This clearly shows not the government but the civil society that controls the whole process, while the former is forced to execute the latter’s recommendations. Well, this is the way how the world community changes itself nowadays. Turkey, this year’s chair, will soon launch a new initiative called “World SME Forum”. This will work as the first advocacy entity for SMEs’ interests as a whole in the international community. The previous era of global economy, where big corporates have dominated the world, will come to an end. They will be rather obliged to be harmonized with their little but much more innovative partners, SMEs. A new wave is about to be caused by our B20. I fully support the Turkey’s initiative and will actively advocate for SMEs interests in both Japan and the international community. Last but not least, please watch out the next year’s chair of G20 and B20 is China. Can you understand what I mean by mentioning that, dear Japanese readers? ?